We’ve been raised more than $25,000 for the period of 2014-2017 through friends of Mosaics in addition to generous grants from Presbyterian Church (USA). 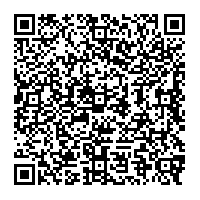 Please click following “Give Now” button or scan QR Code to give your love-offerings instantly. • The COM of the Presbytery of Sacramento, PC(USA) approved the Rev. Dr. Stephen Moon to be a member-at-large on its meeting on September 26, 2013, to start working as an evangelist for the Millennials (aka Mosaics). • The Presbytery of Sacramento voted to accept the Rev. Dr. Stephen Moon into its membership at the Stated Meeting of the Presbytery on November 12, 2013. • The first community outreach program, “Korean Class for Mosaics (KCM)” launched on November 16, 2013 at Pastor Moon’s house in Elk Grove, CA. • Fellowship of Mosaics was officially approved as a “New Worshiping Community (NWC)” by the Administrative Commission for New Worshiping Communities (ACNWC) of the Presbytery of Sacramento on Feb. 18, 2014, and by the Mission Development Resources Committee (MDRC) of the Presbyterian Mission Agency, PC(USA) on March 21, 2014 (Project #1418). • Congregational Support Committee awarded the “Durable Equipment Joint Acquisition Fund” for the purchase of our musical instruments and speaker system on March 18, 2014. • Fellowship of Mosaics secured its first temporary worship gathering place at the Parkview Presbyterian Church (727 T Street) and started gathering from June 14, 2014. • Fellowship of Mosaics completed the mandatory “discernment process,” the leadership Bible study and prayer meetings on September 7, 2014. • Fellowship of Mosaics started the “Second-Term Korean Language and Cooking Class for Mosaics” since June 2014. The “Basic Russian Class” started from September 2014 and the “Basic French Class” started from November 2014. • Fellowship of Mosaics was officially approved to receive the “New Church Development (NCD) First-Level Grant” during the month of October, 2014 by the Presbytery of Sacramento and the Mission Development Resources Committee (MDRC) of the Presbyterian Mission Agency, PC(USA). • Fellowship of Mosaics started the Mandarin Chinese and the guitar classes from February 2015. • Rev. Dr. Stephen Moon started language classes and instrumental class at Davis Community Church from March 14, 2015. • The Session of Davis Community Church approved the Rev. Dr. Stephen Moon to lead a New Worshiping Community, “Davis Mosaics” (with Mosaic Tea & Coffee) on April 21, 2015 to outreach the Millennials in Davis, CA. • Pastor Moon started Davis Mosaics Fellowship officially from April 2015 at the 2nd Floor Rooms of Phoenix Hall at Davis Community Church. 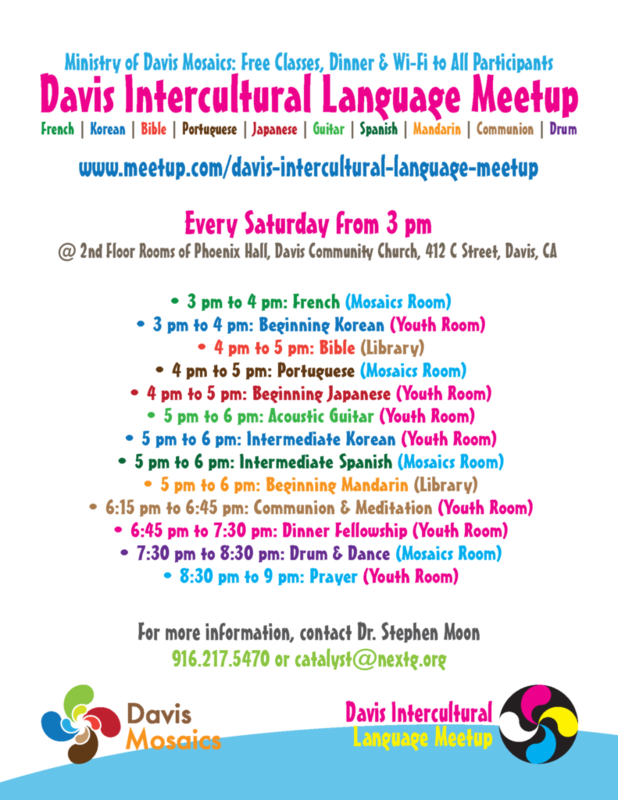 Currently, Davis Mosaics offers 6 language classes, acoustic music classes, and cooking classes on Saturdays to reach out Millennials living in Fairfield, Vacaville, Davis and Sacramento Metropolitan Area. • Davis Mosaics was officially approved as a “New Worshiping Community (NWC)” by the Administrative Commission for New Worshiping Communities (ACNWC) of the Presbytery of Sacramento on October 13, 2015. • Davis Mosaics & Mosaics Tea & Coffee held their first community dining event, Mosaic Feast” with Chéf Seonkyoung Longest on October 9, 2015. • Davis Mosaics was approved by the Mission Development Resources Committee (MDRC) of the Presbyterian Mission Agency, PC(USA) on November 20, 2015 as an official New Worshiping Community (Project #1551). • Fellowship of Mosaics started gathering at Faith Presbyterian Church on June 5, 2016. • Rev. Dr. Stephen started coaching session with Rev. Perry Sakai from May 3, 2018. • Davis Mosaics started Davis Community Drum Circle on October 4, 2018. Our vision is to mobilize the least evangelized generations, Millennials (aka “Mosaics” or GenY) and Post-Millennials (aka GenZ) for the Kingdom of God by liberating them through love of God, grace of Jesus Christ, and power of the Holy Spirit. We exist to build authentic koinonia (Acts 2:42-47, “spiritual haven”) while pursuing the Great Commandment (Matt. 22:36-40) and the Great Commission of Jesus Christ (Matt. 28:16-20 & 2 Cor. 10:15b), especially for Millennials and Post-Millennials in the Sacramento Metropolitan Area. We exist to liberate Millennials and Post-Millennials from the darkness by experiencing God’s love, grace and salvation through koinonia filled with agape, healing prayers, transformational leadership trainings, disciple-making, community-rebuilding projects, gift-shaping classes, and faithful missions (Heb. 11 & James 2:17-18) empowered by the Holy Spirit. We exist to mobilize Millennials and Post-Millennials to become harvest workers of Christ (Luke 10) to transform broken communities into transformational communities of faith, hope and love (Acts 2 & 1 Cor. 13). We have established a leadership team consisting mature Gen Yers and in their late-20s to mid-30s and some Gen Xers who have been very supportive. 1. Building major and minor financial supporters: Still in progress as most our major donors are no longer supporting or made one-time gifts. We need major donors/sponsors now. We are receiving small contributions from our participants and micro supporters. We will launch our 2nd fundraising campaign in 2018. 2. Building language classes and special events for target group (Millennials & Post-Millennials): Continues and working well. 3. Building partnership with established Presbyterian churches: FoM began as a NWC of the presbytery not with a partner congregation. Faith Presbyterian Church provides the space we need with very low rent beginning June 2016. We still believe that the South Sacramento/Elk Grove is our target area where Millennials are more visible and active. Davis Mosaics continues building strong partnership with Davis Community Church. 4. Building music/worship ministries: We have ongoing music instrumental classes weekly but are interrupted at times due to a lack of teachers. We continue to seek worship leaders and/or music teachers who are either Millennials themselves or GenXers who comprehend the Millennial ministry. This has been difficult, but is not impossible. 5. Building children’s ministry: Currently, we have 7~8 children under age of 12 coming to our fellowship regularly. We don’t have suitable space to host young children at present as well as lacking teachers and volunteers for them. We need to pray about how to build a successful children’s ministry. 6. Starting regular Bible study and worship: We started a “Genesis Bible Study” in July 2017 with 7~8 people at Faith Presbyterian Church. We will continue the “Romans” at Davis Community Church in 2019. We found out that more Millennials are interested in learning about God and hopefully our Bible study classes along with Mosaics Leadership Forum will win many souls. We are slowly introducing how Mosaics worship will look like through the Bible study as we occasionally play contemporary CCMs during our Bible study. We are careful to connect Millennials to God as Millennials do not want to be forced or regulated. Now we are experimenting with various worship styles in our Saturday, Sunday and weekday gatherings to develop spirituality-formation within the lifestyle of Millennials. Worship at Mosaics will not be as it is traditionally expressed in congregations. We constantly develop and refine marketing materials targeted to Mosaics. These materials include printed business cards, postcards, brochures, and posters/flyers to pass out at or post in neighboring businesses. We continue to become a “fellowship of difference and differents” as our utmost mission is to transform Millennials (aka Mosaics) and GenZ to experience God’s grace, love, holiness and purpose in their lives, so that they may be ultimately transformed to be Christ’s faithful disciples and evangelists. McKnight, Scot, A Fellowship of Differents (Grand Rapids, MI: Zondervan, 2014), 12. Jesus said, “If you hold to my teaching, you are really my disciples” (John 8:31). In response to the question of “what is the greatest commandment in the Law?,” Jesus replied, “Love the Lord your God with all your heart and with all your soul and with all your mind.” This is the first and greatest commandment. And the second is like it: “Love your neighbor as yourself.” (Matt. 22:36-39). We are not ready to start discipleship training, as most of our participants are still seeking and learning about God. We hope to see many Christians birthed from our fellowship and Bible study as God touches each person’s heart each and every day. Stephen and Grace are constantly praying for everyone who belongs to Mosaics and they reach out to those who are in need of prayers and pastoral counseling through social media and face-to-face meetings. Our ultimate goal is that everyone becomes a disciple of Christ. This requires life-changing transformation through faith and obedience to the Word of God. Mosaics seeks to make disciple-making disciples through our koinonia and spirituality formation classes. Mosaics Community of Faith, Hope & Love! Copyright © 2013-2019 Intercultural Fellowship of Mosaics. All Rights Reserved. A ridiculous amount of coffee was consumed in the process of building this ministry. Add some fuel if you'd like to keep me going!